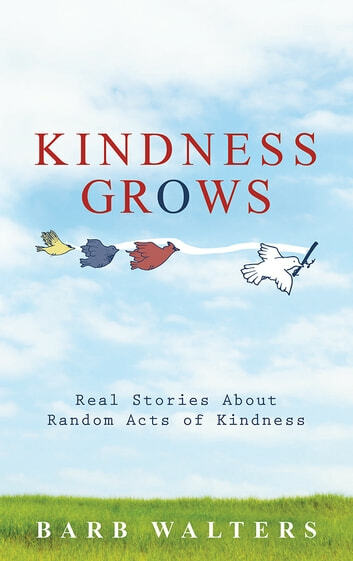 Random acts of kindness serve as a positive outlet in a world filled with negativity and challenges. Kindness feels good whether we are the giver, the recipient, or even the observer! In that moment of compassion and generosity, we are at our best. There is a connection, a magical synchronicity, and life suddenly becomes lighter and brighter. 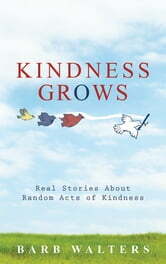 Kindness inspires gratitude, happiness, spontaneity, and it motivates others to be kind and pass it on. These stories remind us that we all have something to offer. There are many opportunities every day to comfort and support others in seemingly small but significant ways. The impact and power of an act of kindness cannot be underestimated. In some cases, the outcome can be life changing! Just step out of your daily routine a little bit and surprise someone. Share your kindness today and every day, and you too can make an ordinary day extraordinary! "Kindness Grows could not have been delivered at a better time. We all need a reminder of an act of kindness, whether we are receiving or giving. The results are the same; our lives and the world become a more loving place to be. Your heart will open to Barb's variety of compassionate accounts by everyday people and remind us of the most important part of being human. " "I thoroughly enjoyed every story! These stories make you think long and hard about the life you are living and how you are living it. I feel like sharing this with my friends so they can have the same feeling I have now that I had the joy of reading it!" I Like How I Feel When I Giggle and Squeal!